"I Passed the Written, Now What?" CFI: "Wow, great job, let me see." This conversation plays again and again in hundreds of flight schools around the country. In this sample report to the right, Mr Garcia passed the test with an 82. Anything above a 70% is considered passing. We used to tell students, "Anything above a 70% is a waste of time." Well times have changed and the FAA wants to improve pilot training standards a bit. Next time you take a trip on SouthWestern Airlines, those two pilots both got a 70% on all their written exams, Private to ATP. The captain missed 30% and the first officer missed another 30%. Wow, thats 60% of the knowledge that should be known by these pilots is missing. When you consider the Paredo Principle, that means that they only know 20% of the remaining 40%. That means they only know 8% of what they should know. That means they forgot or failed 92% of the aeronautical knowledge they should possess. Scary. I certify that (First name, MI, Last name) has received the additional ground training as required by section 61.39. I have determined that he/she is prepared for the Private Pilot Airplane Checkride(name the practical test). CFI signature, date, certificate number. I certify that (First name, MI, Last name) has received the additional ground training as required by section 61.49. I have determined that he/she is prepared for the Private Pilot Written Exam(name the knowledge test). CFI signature, date, certificate number. The examiner must review deficient areas of the written exam to be sure that you've got it. This changed in 2004 with revision D of the DPE Handbook. No longer can the DPE accept the instructor's endorsement that you've learned from your mistakes. Here's what you should do now. Pick up your review guide. Those codes are described at the back. They will tell you exactly what questions you should review. 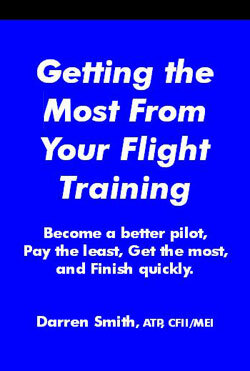 After you have studied them, go back to your CFI to schedule some ground training to review those questions with him. If you don't have the decoder for these codes, you can do a websearch for AC60-25 Knowledge Codes for Airman Knowledge Testing. This publication is great because the FAA has finally given the student a source for what exactly he should study to pass the written exam. For example, Mr. Garcia got one of the questions wrong in subject areas I21 and I22. The advisory circular tells you to study Aviation Weather AC00-6 for these areas: I21 Temperature and I22 Atmospheric Pressure and Altimetry. After you've reviewed your deficient areas, you'll receive the appropriate endorsement. If you've failed the test, you'll retake the test (yes you pay again too). You'll keep both sets of results to give to the examiner during the checkride. Budget your time so you have sufficient time to study prior to the day of your test. Use a review guide: Gleim, ASA are among the best. Eat before you take your test. Focus on proteins and carbs so that you have energy. Don't overdo it or you'll be miserable. Bring additional clothing for warmth incase the testing room is too cold. Be sure to get proper rest the night before the exam. Postpone it if you did not get enough sleep. Go to the bathroom before you enter the testing room. Don't even think about cheating, your FAA record will be ruined. Read the directions carefully - understand what you're doing. Slow down. Finally, a positive attitude goes a long way. Tell yourself that you'll pass and with proper preparation, you will.